Scans of the latest Japanese publication CoroCoro showcase new evolutions and details about fairy-type Pokemon. Japanese forums were abuzz with pictures from the latest CoroCoro, a Japanese magazine with a long history with the Pokemon franchise. 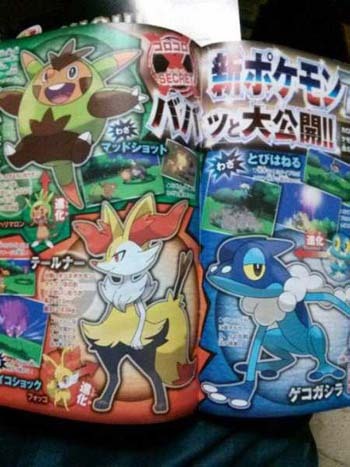 Magazine scans revealed the Pokemon X and Y starters's middle evolutions, though their final evolutions are still unknown. Each starter remains the same type without any additional types for the first evolution. According to Serebii, Chespin evolves to Hariboogu with the move mud shot, Fennekin evolves to Teerunaa with the move psyshock, and Froakie evolves to Gekogashira with the move bounce. The magazine also revealed more details about fairy Pokemon in battle. The fairy type is super effective against fighting, dark, and dragon-type Pokemon, while its moves are not effective against fire, poison, or steel. As a reminder, Pokemon X's legendary Pokemon Xerneas is a fairy-type while Pokemon Y's legendary Pokemon Yveltal is a dark/flying-type. Fairy Pokemon are weak to poison and steel, resistant to fighting, dark, and bug, and immune to dragon-type moves. CoroCoro also clarified Mewtwo's mega evolution -- in that Mewtwo gets two mega evolutions depending on whether you have X or Y. Mega Mewtwo X needs the Mewtwonite X item to mega evolve. Similarly, Mega Mewtwo Y needs Mewtwonite Y.
Additionally, the new games have a limited customization for changing your character's appearance. A famous actress in the game owns a beauty salon where she can change your character's hair and clothes. Pokemon X and Y releases worldwide on Oct. 12 for the 3DS.